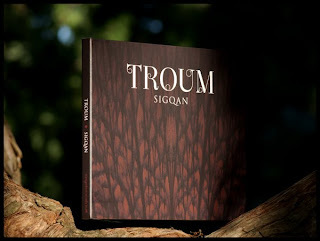 Troum re-releases their mysteriously alluring Sigqan on Transgredient Records. These three part live sessions were originally recorded in 2002 and released on Desolation House records a year later. Sigqan which means “sinking” or “to sink” in old Germanic Goth unravels time with abyssmal washes of hypnotic layered strings and atmospheres that encapsulate your senses for sixty-three minutes. These compositions reveal some of their best live studio work in the past decade making this well worth a re-release! It is always a pleasure working with these legendary musicians that have practically defined the drone/dark ambient music of the past decade. Special thanks for the beautiful Narziss font by Hubert Jocham!